We received some welcome rain in Eastern Iowa during the past few days. Crops are moving along at a rapid pace. 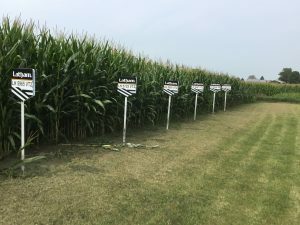 Pictured here are three awesome full season hybrids that everyone should here should consider planting in 2019: LH 6285 VT2 PRO, EX 6397 VT2 PRO, and LH 6425 VT2 PRO. It’s a very busy time of the year as farmers are getting silage harvested; getting their combines ready to roll, updating precision equipment, and attending field days to make crop decisions for 2019 while they can take advantage of the highest cash discounts. 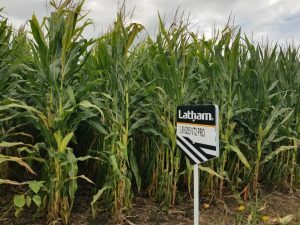 Here is a nice looking Latham® corn plot in Black Hawk County. Combines will be likely roll here in another three weeks. Northern Iowa has received plenty of rain, so the top of these soybean plants have really filled out this past week. 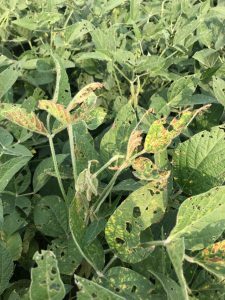 Some farmers have been spraying for aphids, and we’re starting to see some Sudden Death Syndrome (SDS). 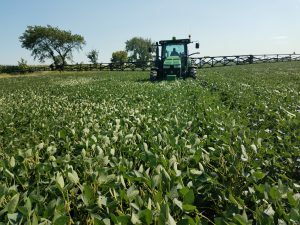 Remember to note areas with SDS, so you can choose IRONCLADTM soybean products the next time those fields are planted to soybeans. 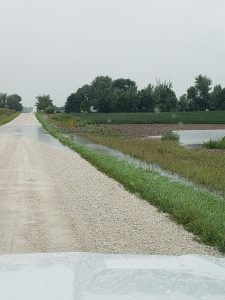 The Fort Dodge, Iowa, received six inches of rain on Monday, Aug. 20. Another four inches fell there on Aug. 21. Ten inches of rain in a short amount of time is causing flooding. Latham’s LH 4454 VT2 PRO RIB is looking good! This particular field was planted during the first week of June near Emmetsburg, Iowa. 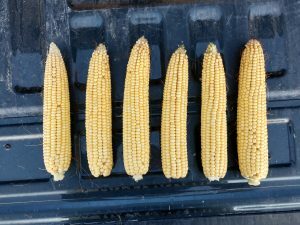 The average size of the six ears I picked from one row is 16×36 at final stand of 36,000 plants per acre. It’s been great seeing all of the late new growth on the soybeans from the late August rains. Latham LH 4835 VT2PRO RIB looks like it’s coming along nice, as well! 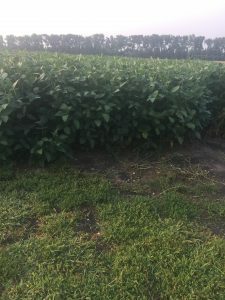 Sudden Death Syndrome is showing up in susceptible soybeans. Remember, the best way to combat SCN is to plant resistant varieties or avoid susceptible varieties. 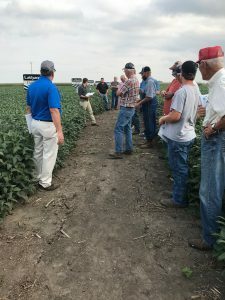 Be sure to keep Latham IRONCLAD™ soybeans in mind when mapping out which varieties will be used on different fields in the future. Crops are moving along very quickly in Southern Wisconsin and development is 5 to 7 days ahead of the average. Corn Silage Harvest is just around the corner. 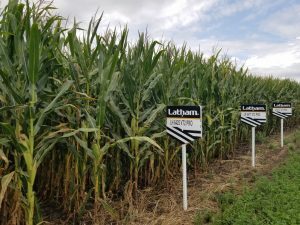 Latham’s LH 5215 VT2 PRO looks fantastic in Platteville, Wisc. 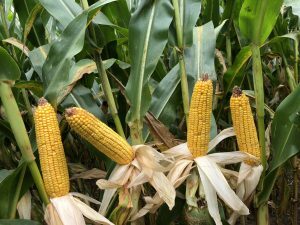 While grain yields are good with this product, the milk per ton makes this an excellent dual-purpose corn hybrid. Although dry weather seems to be the norm, crops in Northern Wisconsin still look good. 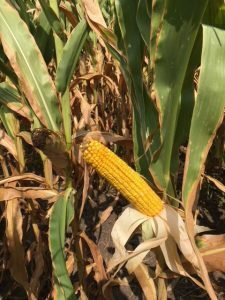 I walked several fields this week and noticed some denting in a few fields but the majority of corn is still in milk stage. 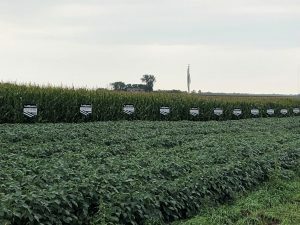 Pictured below are two impressive hybrids in one of my plots that was planted May 16 at a plant population of 32,000. 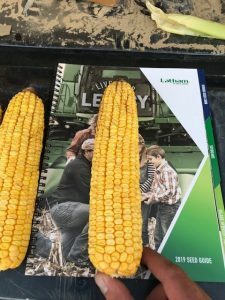 LH 4437 VT2 PRO RIB is a girthy hybrid with a semi-flex ear. I pulled a random ear that had 18 rows and 38 kernels per row. 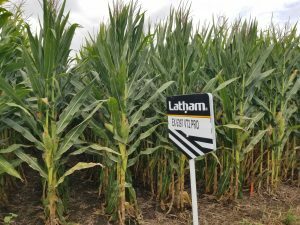 Latham’s Super Star LH 4454 VT2 PRO RIB is a very good looking hybrid with a determinate ear and excellent stay green. I counted an ear with 16 rows and 40+ kernels per row. 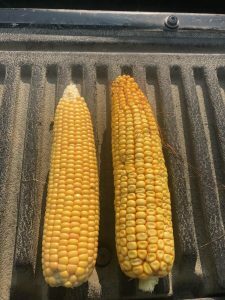 These two hybrids are in a plot with later day maturity hybrids yet are holding their own. I look forward to watching the yield monitor on this plot! Wheat harvest is wrapping up in my region. Spring wheat yield and protein vary, depending on rainfall and variety. Overall, the wheat crop is average to above-average in my region. 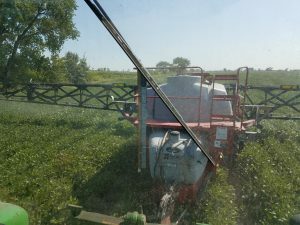 We are finding aphids in fields this week, so farmers are spraying. 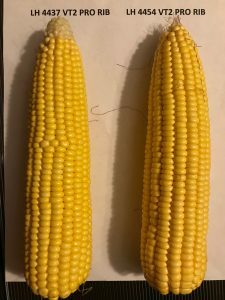 These pictures were taken in a great looking field of L 0858 R2X south of Barnesville, Minn.
Pictured here is a field of LH 4450 CNV at its finest. The corn is at 50% milk. As usual, I found plants standing less than 6′ tall with ears of 18 rows around and 32+ kernels long. This is such a rock star hybrid, but you have to actually walk in the field to see it. Most areas across the state picked up some much needed rain this past week. Soybeans are trying to fill pods but needed a drink to finish filling nicely. While the crops continue to put on bushels this week, we’re getting to visit with growers at Dakota Fest in Mitchell. Saving rains, ranging from 1 to 5 inches, fell across many areas during the last week. Many areas in the east that were showing drought stress should be in better position to finish off the crop after a 2-inch rain. Corn is packing in dry starch now. 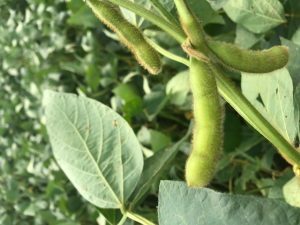 Soybean pods are filling, as well as adding pod clusters on lateral branches and tops. Central South Dakota missed the rains again, so areas west of Highway 281 are especially dry. This field of Latham L 0842LL soybeans look extremely healthy. I can’t wait for harvest results! 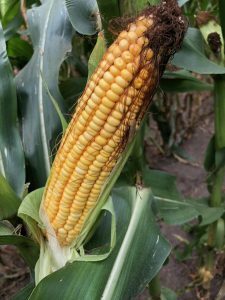 Crops in the southern part of North Dakota caught a two-inch rain last weekend. It literally turned the crop around in 12 hours. Grass turned green again in the ditches and yards. Now our Latham® dealers and customers in the north and western part of the state are praying for the same. 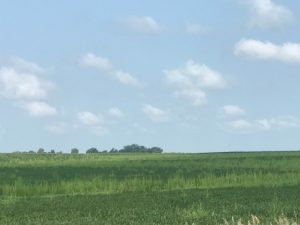 These photos were taken of fields that have received barely a ¼ inch of rain in the last 30 days and about 8 inches during the entire growing season. Surprisingly, the quality of the corn crop is still above average. 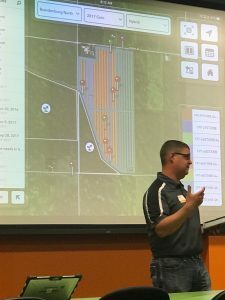 Farmers, who spent more money per acre on balanced fertility and soil health, are see a difference in their crops as we head down the final stretch under such adverse growing conditions.